I guess the logical question is: Who is "us?". 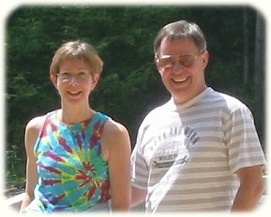 "Us" is Phil and Lisa Malone, and we're responsible for designing and producing the Web Energy Logger. I (Phil) have a BS in Applied Physics and my true love is Robotics software. Lisa has a BS in Business Administration and her true love is teaching Jazzercise. That's us in the very flattering picture on the right. Together we produce the coolest low-cost web-based energy logger you can buy. I do all the hardware and software design work, and Lisa assembles the boards and makes sure they ship to users in perfect order. We do all this at the office we share in our Western Maryland "Cool House", all the while checking out the deer, bear, and birds of many colors that pass by our windows. So, even though I do talk with a "Funny accent", WEL's really are Made in the USA.